Paul is a Advanced PGA Professional with over 20 years of experience within the profession. He has a wealth of coaching expertise which he has gained from working with a number top class coaches. This has helped him to develop an expansive teaching knowledge which enables him to deliver simple and effective coaching for all levels of golfer. Paul’s teaching style puts people at ease and makes learning fun whist imparting expert knowledge that allows pupils to improve quickly and successfully. Paul is available for individual lessons, group lessons, video lessons and junior coaching. Junior coaching roll up sessions are available at 1.30pm every Saturday (subject to weather). To book a Golf Lesson or to discuss a coaching programme with Paul call 01925 263061 or drop him an email at paul@golfstorehouse.com. Walton Hall Golf Course is a fantastic 18 Hole Championship municiple golf course in the Warrington Area. Open to all, this challenging course is regarded as a hidden gem in Cheshire having been designed by Peter Allis and Dave Thomas. The course is ideally located close to the centre of Warrington in a beautiful rolling parkland location with stunning mature trees, adjacent to Walton Hall and Gardens. It has excellent road links being just off junction 11 of the M56. Walton Hall Golf Course is an official Golf Foundation Grass Roots Centre and we offer the Golf Foundations Junior Golf Passport Program. Paul Hodgson is the Director of Golf and PGA advanced professional with extensive experiance and qualifications in teaching golf. Junior coaching with Paul is fun and eductional and open to all age groups and abilities. The focus of the Golf Foundatio’s ‘HSBC Golf Roots’ programme is on growing the game and developing young people through golf. Golf Roots was introduced in 2003 to provide opportunities for children and young people in areas where golf had not previously been see as an option. The project has now evolved into the largest and most successful junior golf development project in the British Isles. The Golf Foundation’s work is based on the’Skills for Life’ concept which promotes the idea that children and young people are able to develop not only playing skills, but also personal skills (such as honesty and respect) through the Foundation’s initiatives (including Tri-Golf and Golf Xtreme). ‘Skills for Life’s is delivered through the Golf Foundation’s national project – ‘HSBC Golf Roots’ – which includes community activity in schools and clubs as well as special projects that target inner city and urban areas. HSBC’s support for the project was announced in July 2011. 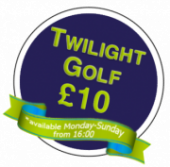 For further information contact Paul Hodgson on 01925 263061 or email paul@golfstorehouse.com Or simply roll up at 1.30pm on Saturdays throughout the year.